KUALA LUMPUR: The ringgit opened marginally lower today against the US dollar as investors stayed on the sidelines as they wait for the Federal Open Market Committee meeting today. 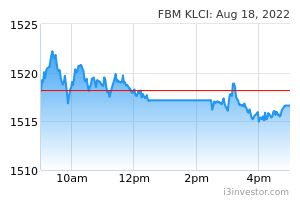 At 9 am, the ringgit stood at 4.0770/0800 compared with 4.0760/0800 at yesterday's close. A dealer said investors would be watching closely the policy meeting for new market direction. "After the US Fed increased the interest rates four times last year, the policymaker is expected to hold its rates this time as a response to the global economic slowdown and stocks volatility," he said. On the local front, he said investors are waiting for Friday’s release of Consumer Price Index (CPI) as well as following up on the InvestKL event attended by key lawmakers and global industry players today and tomorrow for any new market leads. The ringgit was also traded mostly lower against other major currencies. It slid against the Japanese yen to 3.6627/6664 from 3.6556/6602 but rose versus the euro to 4.6221/6259 from 4.6263/6312 at yesterday's close. The ringgit also depreciated versus the British pound to 5.4065/4121 from 5.4015/4084 and advanced slipped the Singapore dollar to 3.0173/0200 from 3.0152/0184 yesterday.